As more sensor networks, the Internet of Things (IoT) and smart devices are applied for data collection, including physical parameters or social responses, it is a growing trend that big data is dominating quality of disaster risk reduction, emergency preparedness and emergency operation. How to appropriately use big data depends on quality, transmission, exchange, storage, display and dissemination during the whole process data life cycle. “Data life cycle” means approaches to improve knowledge to use big data. 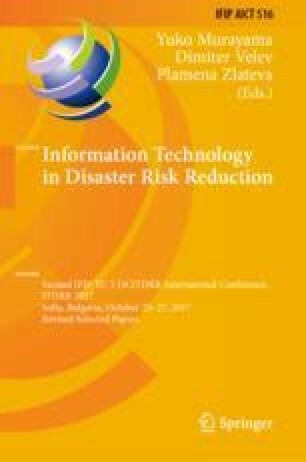 Moreover, to solve issues related to disaster risk management is required to integrate diverse data sets based on the characteristics of individual requests. For example, an execution of early eviction before a typhoon makes landfall, demographic structure, weather forecast, real-time rainfall monitoring, threshold values to trigger flood or landslide and supporting resources are the essential elements for a successful operation. However, lots of digital preparedness need comprehensive coordination and arrangements in advance. In order to further make the most use of data for enhancing public awareness and decision formation, producing open data is also important to reach targeted groups of users through understating key information intelligence to take right reactions. Since embracing policy of open data, it needs enablers to set up a well-regulated environment among original data producers, data aggregator, app or system developers, transmission channel providers and final message receivers. An developing example tells the recent developments on big data and open data for disaster risk management.